Notre Dame defeats Denver in sixth annual PCS. Denver and Notre Dame to meet in sixth annual Pacific Coast Shootout. Notre Dame won its first game of 2019 with a 19-6 win over Detroit. Maryland defeated UNC 11- 7 in the fifth annual Pacific Coast Shootout. Maryland defeated the fifth ranked Villanova Wildcats 13-11 in their last game before heading to the Shootout. UNC upends JHU 13-11 to improve to 4-0. Maryland and Carolina both win over the weekend. 2017 NCAA Division I Champions Maryland to face 2016 NCAA Division I Champions North Carolina in the fifth annual Pacific Coast Shootout. Maryland becomes the third straight Pacific Coast Shootout participant to win the NCAA Division I title. Why does the Pacific Coast Shootout matter? 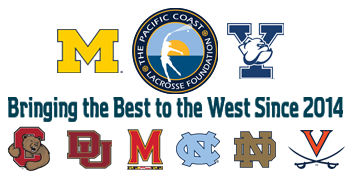 Cornell and Virginia to play in the fourth annual Pacific Coast Shootout. Will Yeatman, former Maryland attackman talks with teh Shootout. Maryland defeats Navy 8-1in season opener. North Carolina defeats High Point 15-9 to improve to 2-0 overall. North Carolina beats Furman 19-4 in season opener. Maryland ranked among the Top 8 in the pre-season and picked 2nd in the Big Ten by a poll of its coaches. Erik Adamson (Foothill HS) scores a career high six goals to lead Denver to an 10-7 win over Notre Dame. Trevor Tierney blog "THE "BEST TEAM" MAY NOT BE WHAT IS BEST FOR OUR KIDS"
Led by a five-goal performance from junior Wesley Berg, DU topples Air Force 14-8. Freshman Aaron Loy returned to the UCSB sideline on Saturday for the Gaucho's game at USC. Notre Dame faces record winter temperatures as it prepares to start the 2014 season. Notre Dame will face Denver in Game 1 of the Pacific Coast Shootout. Denver midfielder Erik Adamson played high school lacrosse at Foothill HS in Tustin.